"What's in your head? In your head.....Zombie!!" The Zombie Horde is on the loose again, making their way towards the nearby Goblin village. The Goblin army must rally together to protect the village walls from the ongoing threat. If they can keep the Zombies from breaching the gates and entering the village, while also killing the Zombie leader, they will claim victory. Otherwise, another town is lost and the Zombie clan will look to add some new recruits. 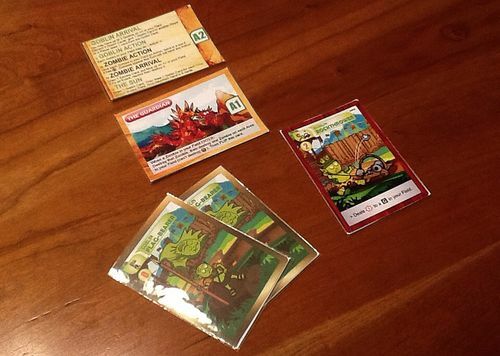 Designed by Jack Darwid (Adventure of D), Goblins vs. Zombies includes various modes, ranging from single to competitive to co-operative. In the following walkthrough review, I’ll cover the co-operative 1-3 player mode, The Boss, which I feel best represents a majority of the gameplay that can be found in the game. Note that the following are based off of prototype components. The game is currently running a campaign on Kickstarter. At its heart, Goblin vs. Zombies is a tower defense game. Players will try to protect their Village by building a wall of defenders, while waves of Zombies approach them. If a Zombie can break through the wall and enter the Village, the players have lost. If however, the players can hold out until they’ve defeated the Zombie leader, they have won. 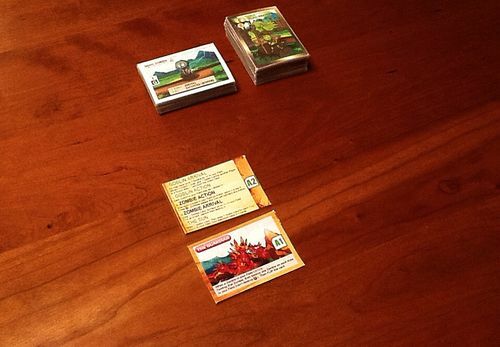 To begin the game, a draw deck of Goblin cards and a draw deck of Zombie cards are placed in the middle of the table. These cards are two-sided. Goblin cards should be placed with their Flag-Bearer side face up (specialized Goblin side is face down) while Zombie cards should be placed with their Basic Zombie side face up (specialized Zombie side is face down). Next, 4 more cards are removed along with the Paladin Zombie card. These cards are then shuffled together to make up Set #2. The remaining Zombie card from the draw deck make up Set #3. The Set #2 cards are placed on top of the Set #3 cards. Finally, the Set #1 cards are placed on top of these Sets to complete the new Zombie draw deck for The Boss mode. The play area is made up of 3 Area sections and a player’s Village Gate section for each player. There are two reference cards available that will show the Area 2 and Area 1 rows that Zombies will enter on their way to the Village. The Area 2 card has information on the various Phases of a Round, while the Area 1 card is a specialized one-time use action that can be taken during the game when a Zombie enters the Village (I’ll cover this later). When Zombies enter play, they will enter into Area 3, which is the horizontal row above the Area 2 card. 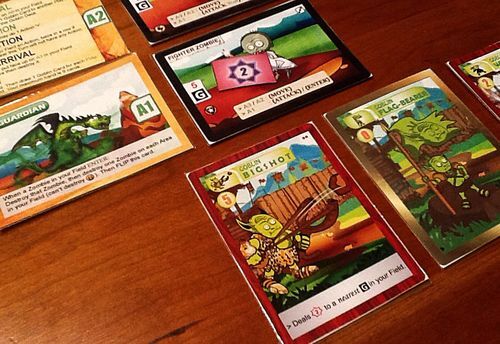 The Village Gate is where a player can place up to 3 Goblins as defenders to the Village, and is located in the horizontal line below the Area 1 card. 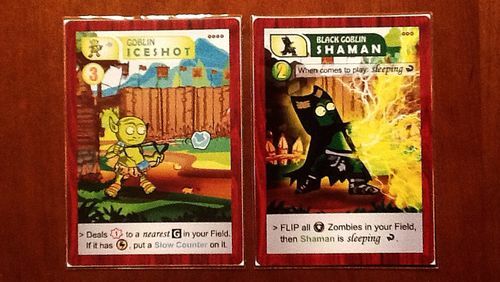 Each player (1-3 in Boss mode) will set up their own personal Village and Area sections around the central Goblin and Zombie draw decks. 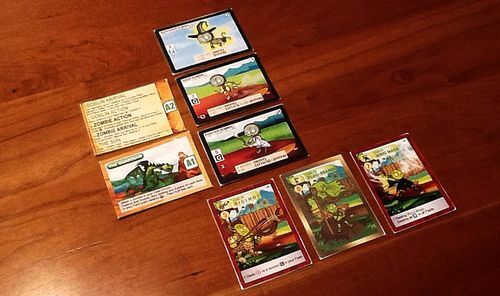 Goblins vs. Zombies is played through a series of Rounds, made up of 5 phases a piece; the Goblin Arrival Phase, the Goblin Action Phase, the Zombie Action Phase, the Zombie Arrival Phase, and the Sun Phase. After a player has completed all 5 phases, play continues to the next player, then the next in a clockwise fashion. 1.) 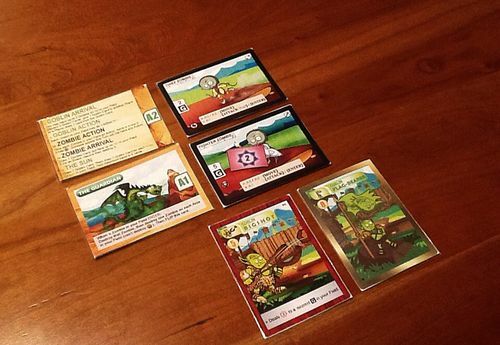 Goblin Arrival - During the 1st phase of a turn, players can place Goblins at their Village Gate area from their Hand. Each Goblin card has a cost to play it, which is shown on the top left of each card. In order to play a card, the player must discard a number of other cards equal to the cost of the card they wish to play. For instance, Player A wishes to place a Goblin Rockthrower at his Village Gate. Because it has a cost of 2, he discards 2 other cards from his Hand into the Goblin discard pile, then places the Goblin Rockthrower into his Village Gate area. As mentioned before, the Village Gate area for each player can hold a maximum of 3 Goblins. On the reverse side of each Goblin card, is a Goblin Flag-Bearer. Goblin Flag-Bearers are free to place into the Village Gate area, thus do no require a player to discard any cards. Although these Goblin Flag-Bearers can not take any Actions, they do allow players to draw extra cards during the Sun Phase at the end of each turn (I’ll go over this in more detail a bit later). 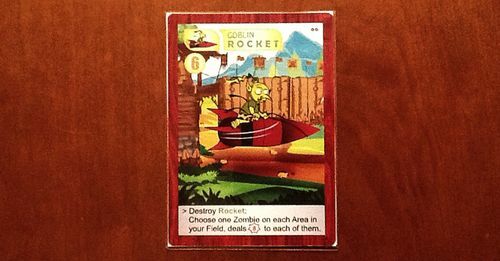 Player A has 1 remaining card in his Hand; a Goblin Rocket. While he could choose to keep this card in his Hand for use in future Round, its cost of 6, and the fact that he currently has no other cards, might entice him to go ahead and flip it over, and play it as a Flag-Bearer. This not only adds 1 more Goblin to his Village Gate defense, but also will allow him to draw an extra card later in the Round. At any time a player has the full maximum of 3 Goblins at his Village Gate, but wants to play another Goblin, he must discard 1 of the 3 Goblins currently present at the Village Gate in order to make room. Also, during the Goblin Arrival phase, a player can choose to discard 2 cards from his Hand to either give a Goblin card to another player, or draw a new Goblin card from the draw deck. 2.) Goblin Action - During this phase of the Round, each Goblin present at the player’s Village Gate can perform 1 Action each. All Actions that a Goblin can perform are listed on the bottom of the Goblin card. There are 3 types of Zombies in the game; Ground Zombies, Flying Zombies, and Invisible Zombies. A majority of Goblins are limited to attacking only Ground Zombies, although there are a few Goblins that can deal with Flying and/or Invisible Zombies. Player B currently has 3 Goblins at his Village Gate, as well as a Fighter Zombie in Area 1, a Thief Zombie in Area 2, and a Sorcerer Zombie in Area 3. By taking an Action with his Goblin Bigshot, he can deal 2 damage to the nearest Ground unit Zombie in his play area. Since the Fighter Zombie is the closest Ground unit, the zombie is dealt 2 damage, leaving it with 3 more health points. 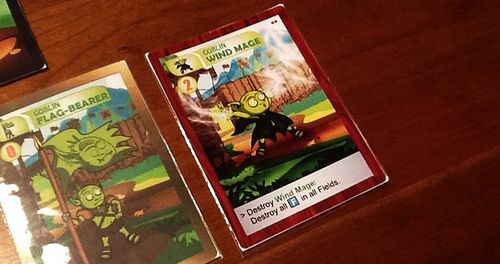 Next, his Goblin Wind Mage can destroy all Flying Zombies in his play area, thus destroying the Sorcerer Zombie in Area 3. However, when this happens, the Goblin Wind Mage destroys himself in the process, thus he will need to be discarded as well. Finally, all that is left is a Goblin Flag-Bearer. This Goblin can perform no Actions, thus the Goblin Action phase has ended for Player B. 3.) Zombie Action - After a players Goblins have performed Actions, any remaining Zombies in play can then perform their own Actions. Each Zombie can perform Actions according to which area they are currently in as referenced on the Zombie card. For instance, taking a look at the Elf Zombie, while in Area 3 and Area 2, the Elf Zombie will always attempt to Attack first. If there are no Goblins at the Village Gate to attack, he will instead Move to the next Area. While in Area 1, he will again always attempt to Attack first, but if there are no Goblins at the Village Gate, he will then Enter the Village (and thus ending the game). 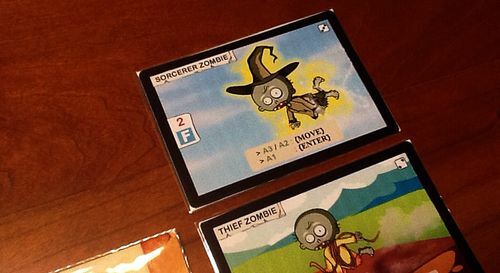 Some Zombies have special abilities, which are represented by icons on the bottom left side of the Zombie card. Taking a look at the Knight Zombie, we can see that he is both armored (star-shield icon) as well as quick (lightning bolt icon). Armored Zombies are normally tougher (higher amount of Health) than other Zombies in the deck. However, there are certain Goblins such as the Black Goblin Shaman that will cause an armored Zombie to lose all of his armor and become a Basic Zombie (by flipping the Zombie card to its opposite side). Quick Zombies are twice as fast as regular Zombies, therefore when taking Action, Quick Zombies are allowed to take two Actions back-to-back instead of just one. Some Goblins, such as the Goblin Iceshot will place a Slow counter on a Quick Zombie, thus turning its speed into that of a Zombie that only takes 1 Action per turn. During this phase, players may choose the order in which Zombies in their play area take their Actions. 4.) Zombie Arrival - After Zombies have taken their Actions, new Zombies will arrive and make their way towards the Goblin Village Gate. The player will draw 1 Zombie card from the Zombie deck in the central area, and will place it in his Area 3. There are a few Event cards amongst the Zombie deck which, if drawn, will resolve their action and placed in the discard pile afterwards. Event Cards can have positive or negative effects, depending on the card. The “Hope!” Event card allows each player to draw a Goblin card from the draw deck. They can then choose to place it at their Village Gate by paying its cost, or they will have to discard it. After this Event card has resolved, it then adds a Reinforcement, which means that another Zombie card must be drawn and added to Area 3. With the “They Are Everywhere” Event card, each player must place a Basic Zombie in Area 3 of their individual play areas. Other Zombies, such as the Ninja Zombie, have effects that happen as soon as they arrive into Area 3. These are noted at the top left corner of the Zombie card, underneath the name of the particular Zombie. With the aforementioned Ninja Zombie, as soon as it comes into play it is allowed to take a Move Action. 5.) The Sun - During the Sun phase, players will be allowed to draw new Goblin cards from the draw deck. Players are always allowed to draw 1 card for free, however for each Flag-Bearer present at a player’s Village Gate, he will be able to draw an additional Goblin card into his Hand. A player is limited to only 9 cards total in his Hand at any time, therefore if a player needs to draw cards that would bring his Hand over this maximum, he must discard back down to 9 cards. After this phase is complete, the player’s turn is over and play resumes with the next player to the right. Player C currently has 2 Flag-bearers at his Village Gate. Therefore during his Sun phase, he is allowed to draw a total of 3 new Goblin cards into his Hand. Each player owns a Guardian which they are allowed to use once per game. If at any point, a player has no Goblins at their Village Gate and a Zombie attempts to enter, the player can activate their Guardian. The Guardian will automatically destroy that Zombie, along with a Zombie from each of the 3 Areas, if present. Once this Action has been used, the Guardian card is flipped so that it may not be used again. There are various special Goblins entitled Black Goblins. These Goblins have powerful abilities and are cheaper to play, except that they always come into play asleep. When a Black Goblin is asleep, it is placed upside down as a reference. There are numerous Black Pepper cards in the Goblin deck, which when discarded, will wake up a Black Goblin at the player’s Village Gate. In Boss Mode, players must cooperatively protect their Village Gates against the waves of Zombies until they can defeat the Paladin Zombie. If a Zombie gets through any of the player’s Gate, the game is lost. Once the Paladin Zombie arrives, 1 Zombie card is taken off of the Zombie deck and placed underneath it each time it takes an Action. 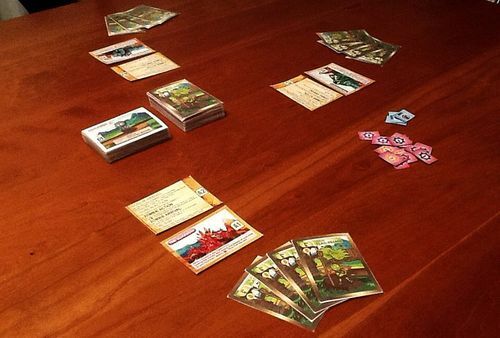 If players can not defeat it before 9 Zombie cards are placed beneath it, the game is lost. If however, players can place 14 damage on him before this happens, they have won. 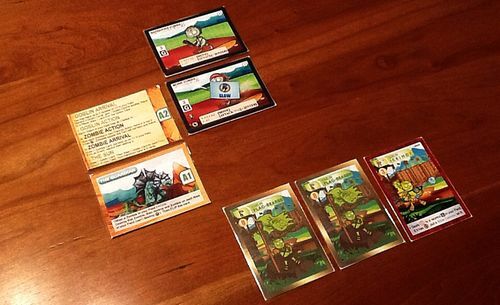 Goblins vs. Zombies uses aspects of hand management and action selection along with co-operative play to present a tower defense game that is both easy to learn and challenging. 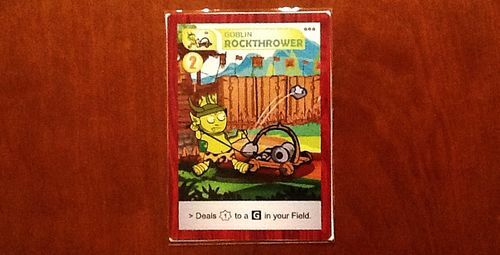 Many will familiarize it with Plants vs. Zombies, though while the similarities are definitely there both in art style and with its delivery, there are not many other board games that come to mind that use the tower defense mechanic in such as smooth way as this. The popular ones that come to mind are Castle Panic and Stronghold, though while both using the tower defense mechanic, play quite differently from Goblins vs. Zombies. While I didn’t cover in detail the various modes in the game, I will note that all of them play differently from each other and provide a bit of depth overall to the gameplay experience. 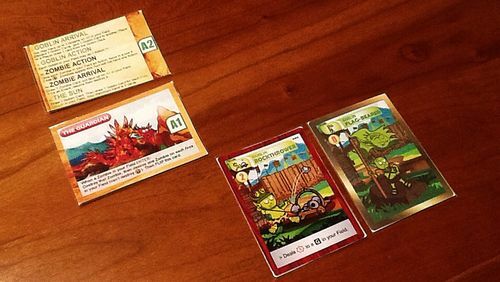 The game can be played solo, co-operatively, competitively, or even head-to-head with one player taking the role of the Goblins, while the other controls the Zombie Horde. There’s a lot of variety to be found, all revolved around a simple rule set. 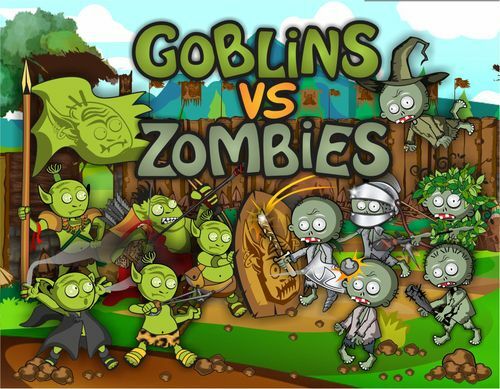 Goblins vs. Zombies is a neat, unique little game that is a fulfilling addition to the underutilized tower defense genre. The game is both challenging and easy to learn, and should appeal to those looking for a deeper filler for game night. If you are interested, check out the Kickstarter campaign, which concludes on October 6th. If you enjoyed this review and would like to read other Radio Reviews, click here to see the geeklist. Very nice and detailled preview. Cook review. Already backed this one.